Liminality: a concept elaborated on by Victor Turner to represent the state of being betwixt and between, especially social or physical states; for example, not a child but not yet considered an adult. 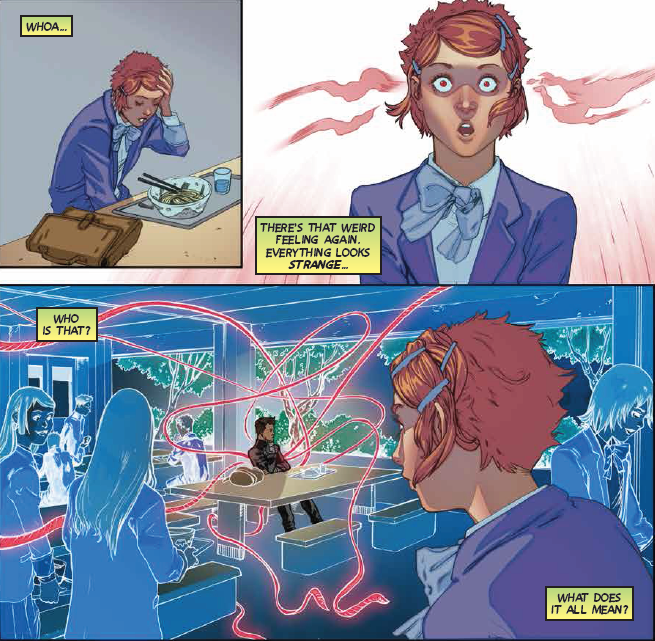 Wayward is a comic via Image, set in modern Japan and intended for older readers, that explores the danger of the supernatural heart of Japan—its yokai, or (roughly translated) its monsters and spirits, its strange and mysterious entities. 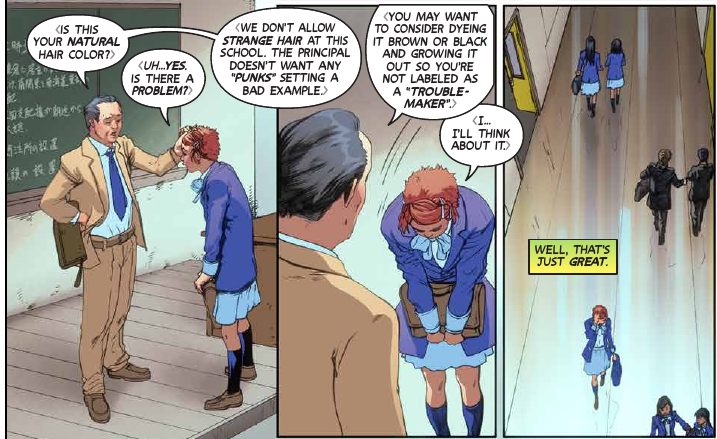 In the first story arc of Wayward, protagonist Rori is half Japanese, half white Irish. Right away we find out that she is living with her mother again after a divorce, and her mother is choosing to move to Japan. In Japanese society, Rori does not fit in: from her red hair—causing her high school homeroom teacher to strongly suggest she dye it black or brown in order to not be branded “a troublemaker”—to even her own feelings of being uprooted and placed in a “greenhouse” where she is to be planted in straight lines and expected to grow neatly within them. She is marked as an outsider. She is not fully an outsider, though, so she occupies a liminal place in society; as her mother is Japanese, and as she speaks Japanese, she is expected to act Japanese as well. Therein lies some of the problem; and this unsettling feeling of not fitting in is made that much worse by the fact that she can apparently see strange red threads. Strange red threads that—in another nod to Asian culture—seem to connect entities in ways that she cannot seem to understand…and which connect her with other strange folk, from a spirit-eating high schooler, to a childish cat figure, to a scared boy who wants nothing more than to be left alone, and has the power to drive others away through supernatural means. Rori quickly finds herself the leader of this quickly established group, if only because she can see these threads when no one else seems to be able to do so. In fact, that is the only reason we are given. Why is she the leader? Surely, the rest of the students seem more natively Japanese; the other high schooler is, albeit thought of as a troublemaker. And the catlike figure is a cat spirit native to Japan called a neko musume. These monsters and spirits, collectively known as yokai, are thoughtfully described in the back of Wayward issues thanks to translator and yokai expert Zack Davisson. But maybe that’s precisely it: Rori finds herself the leader because she is betwixt and between. She is closer to these monsters and spirits because she too does not quite belong in the society she finds herself in; from the circumstances of her birth, to crossing countries and cultures, even possibly her gender (she’s a punk teenage female—hair up short, tomboyish, rough use of language) to her age (her being in high school – which is itself a liminal place, representing neither childhood nor adulthood), she is marked to undergo a rite of passage to find some settled state. Let’s start with her ethnicity—or rather, mix of ethnicities. In Japan, the Yamato are the dominant ethnic group to such an extent, that Yamato is synonymous with something intrinsically Japanese–however, the clans that became known as this ethnicity are said to come over from Korea, and even the chronicles of the Kojiki and Nihon Shoki, court histories reaching back into mythological pasts, support this migration. There are other ethnic groups in Japan today, of course—the Ainu are the indigenous peoples of the Japanese archipelago, for example—but neither Japanese nor English have a good way to describe the ethnic makeup of Japan well. The Yamato have had such a dominance over the centuries that being “Japanese” is being Yamato, and it contributes to this sense of having a shared culture by default. Rori breaks this idea of a shared culture because she is “half” (from “hafu,” meaning mixed ethnicity), and illuminates just how that idea of a monoculture really works. Rori herself tries to describe it using her language skills as an example: in Ireland, her small knowledge of Japanese earned her respect and awe, while in Japan, she is seen as a potential troublemaker because she does not fit in and does not have the shared cultural norms to go with the language. Wayward does this well: it underlines the issues of xenophobia and racism in the country of Japan, as well, without being didactic about it. In terms of her gender presentation, Rori seems to prefer a punk look, which speaks of power and rebellion, though it is also one of the styles of clothing common for teenagers and young folk in Japan. But with her hair being up short, and her speech being rough, her appearance speaks to what we might consider a tomboy: someone between feminine and masculine roles. In terms of biology, Rori’s femininity intersects with her age: as a teenager, she is going through puberty and rapid growth, and all the hormonal and mood changes that go along with it. Add an international move to this, aggravating existing emotions of not fitting in and the frustrations it can cause… it’s treated as, unfortunately, no surprise when in a brief scene of Wayward issue 2, she does herself harm (there is a note about this, and it is treated well, but beware if you are sensitive to instances of self-harm). Of course, from this to her age is an easy step: as Rori is a teenager, she is not quite an adult. Even if she was in her late teens, the coming of age in Japan is considered to be 20 years old, and observed with Coming-of-Age Day (Seijin no Hi) every January; this is different than Ireland, where the coming of age is at 18. She is caught in the middle, and while one could argue that she is bound to where she now resides, I’m not talking legal coming of age, but social. Rori is caught in between. She goes to a high school, but a Japanese high school is more similar to an American college than an American high school, and Japanese high schools, as they are not mandatory to attend, can emphasize social belonging and conformity in addition to academics or whatever specialty the high school in question has. The fact that Rori is treated as a “concern”, that she’s dozing off in class (due to supernatural adventures the night before) illustrates that she does not quite fit in socially to this atmosphere. Even if she tries to conform the best she can, she will never truly belong in this society; it is with others in her ragtag group that she seems to be tied to with a common thread. Rori does, in the end, find where she belongs. 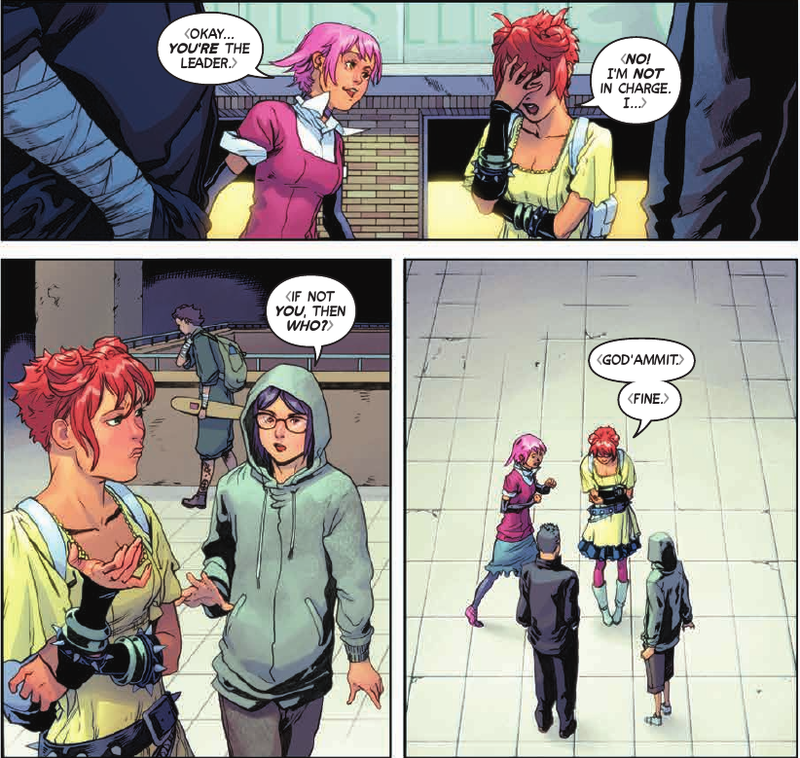 She does makes a stand, as to what is important to her, in an explosive finale to the first story arc. But the greater story of Wayward—and of those caught in between—only just begins. If you haven’t already picked it up, please do so – the trade paperback containing the first story arc is now released via Image Comics!